Painting of the Buddha's first sermon in which he elucidated the Four Noble Truths. 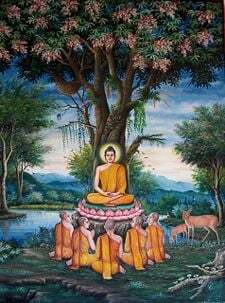 The Four Noble Truths (Pali: Chattari Arya Sachchhani) are the foundational teachings of Buddhism, typically given as the first lessons to anyone being introduced to the religion. More than simply a doctrine, they contain a way of life that followers believe can lead anyone to Nirvana (Pali: Nibbana), Sanskrit for "extinction" of suffering. Arising from the Buddha's enlightenment experience, they are regarded as deep psychological insight and a step-by-step cognitive methodology, not a mere philosophical theory. Why have I declared (the four noble truths)? Because it is beneficial, it belongs to the fundamentals of the holy life, it leads to disenchantment, to dispassion, to cessation, to peace, to direct knowledge, to enlightenment, to Nirvana. That is why I have declared it. The Four Noble Truths affirm that suffering can be completely eliminated in one's life as long as a person devotedly follows these teachings. They present a permanent cure for suffering, one that is said to destroy suffering at its very root. Buddhism suggests that each one of us has the power to end suffering in our own lives without the intercessory sort of help from God that one often finds in non-Buddhist systems and cosmologies. Nevertheless, Christians, Jews and other believers in God have also found the Four Noble Truths invaluable guidance for advancing on their path and opening to the fullness of grace. The Eightfold Path is the prescription given to us by the Buddha to cure the samsaric condition of duhkha. Through following his instructions, he believed that anyone, regardless of race, caste, religion, or gender, could attain the same awakening as him. Since the Eightfold Path is considered to be the essential "medicine" that the Buddha prescribed to alleviate suffering, this "medicine" will be described in the following section. According to Buddhism, the Eightfold Path provides the practical steps to eliminating suffering in our lives. Someone just entering the Buddhist path is expected to make mistakes, but by having the ideals of the Eightfold path in mind, they will be able to evaluate their actions and improve upon them. The Eightfold Path is divided into three subcategories: wisdom (prajna), ethics (sila), and meditation (samadhi). The word "Right" (Samyak) that precedes each part of the Eightfold Path implies the skillful application of each step. The first component to the wisdom section is “Right View.” This refers to seeing the world correctly, particularly in regards to accepting the Four Noble Truths and the three marks of existence as accurate depictions of samsara. The most important views to hold for a Buddhist are impermanence (anitya), no-self (anatman), interdependent arising (pratitya-samutpada), suffering (duhkha), and nirvana. The worst view one can maintain is that “the elements of the psycho-physical personality (skandha) constitute a truly existent person.” The concern that the Buddha had with wrong views was not a purely philosophical one. The way we see the world determines how we interact with it, and if we see ourselves as isolated, self-contained, and unchanging beings, we will be unable to escape the influence of the three poisons (klesha) of greed, hatred, and ignorance. “Right Thought” is concerned with the intentions and motivations of one's actions. The Buddha taught that karma is formed through intention, so that when one does anything based on negative emotions, the result is negative karma. However, if one acts from the motivations of compassion, wisdom, and generosity, the results are positive. The highest ground for any action in Buddhism is said to be a heartfelt concern for the welfare of all beings. The “action” section has three divisions. The first is “Right Speech,” which is directly connected to Right Thought. It cannot be simplified to “do not lie,” because one can use the truth in a way that is deliberately harmful (i.e. unnecessarily pointing out another’s flaws or gossiping), and in some situations telling the truth may cause more harm than telling a “white lie” (as in the classic example of misleading to someone who is looking for a person they want to murder). Therefore the Buddha taught that when we speak, we must consider what is helpful (kusala) and what is not (akusala). The second is “Right Action,” which is concerned with the motivation behind everything we do. Contained within this are the five precepts, which list actions followers should refrain from, such as harming other beings and taking what is not given. As well, they are again encouraged to perform every deed motivated by compassion for all beings. “Right Effort” has four dimensions: preventing negative states from arising in the mind, abandoning any that have arisen, producing positive ones, and cultivating ones already present. This demonstrates the Buddhist practice of applying antidotes to unwholesome mind-states—greed is countered with generosity, hatred with love, and ignorance with wisdom. Meditation is divided into two sections, the first of which is "Right Mindfulness," which is intended to bring about a constant awareness of our sensory experiences (including the use of the “mind’s eye” that is aware of mental formations) and actions. Buddhists believe that through constant watchfulness, we will recognize the truth of the impermanence of all experiences (including the skandhas that we normally mistake for an unchanging self). Mindfulness also helps to prevent reflexive actions based on harmful emotions, mitigating both injury and negative karma. “Right Concentration” aims to train our unfocused, scattered minds to rest on a single object. Once one is able to sit in meditation, unmoved by laxity or excitement, one can enter the deeper meditative absorptions that led the Buddha to realize nirvana. The practices of the Eightfold Path are meant to be taken on as mutually reinforcing guides that lead to liberation from suffering. As such, they cannot be effectively practiced in isolation from one another. The image used to depict this path is an eight-spoked wheel, which is found on the modern day flag of India. The most important Theravadin commentary on the Eightfold Path, the Visuddhimagga (“The Path of Purification”), was written by the Indian scholar-monk Buddhaghosa (c. fifth century C.E.). This text continues to be used today within the tradition as an invaluable guide to these practices. The Four Noble Truths have had a tremendous impact on the history of Indian and Asian thought. As the foundational teachings of the Buddhist religion, these precepts have inspired and motivated countless Buddhists to gain a deeper insight and appreciation of the nature of suffering and how it is overcome. They have also played a critical role in the cultivation of Buddhist philosophical discourse and monastic practice. While the Four Noble Truths are core teachings of Theravada Buddhism, they also play an integral role as essential stepping stones in the cultivation of spiritual wisdom and compassion in both Mahayana and Vajrayana Buddhism. Thus, the Four Noble Truths are unifying principles in the world of Buddhism that unite the various Buddhist organizations and communities. ↑ Bhikkhu Nanamoli. 1995. The Middle Length Discourses of the Buddha: A New Translation of the Majjhima Nikaya. (Boston, MA: Wisdom Publications), 533-536. ↑ Donald W. Mitchell. 2002. Buddhism: Introducing the Buddhist Experience. (New York: Oxford University Press), 47. ↑ Traleg Kyabgon. 2001. The Essence of Buddhism: An Introduction to its Philosophy and Practice. (Boston, MA: Shambhala Publications), 11. ↑ John Powers. 1995. Introduction to Tibetan Buddhism. (Ithaca, NY: Snow Lion Publications), 59. Traleg Kyabgon. 2001. The Essence of Buddhism: An Introduction to its Philosophy and Practice. Boston, MA: Shambhala Publications. ISBN 1570624682. History of "Four Noble Truths"
This page was last modified on 20 April 2017, at 14:43.